Before our participation in the Eating School, our daily life was compromised, nobody could take care of our daughter. Two times per week she was at daycare where she could play with other children, but I had to fetch her early to tube feed her. As my daughter got a Nissen fundoplicatio, she was not able to vomit but gagged and retched regularly. We will never forget the day on which she finished her soup for the very first time as well as all other improvements. Our child surprises as frequently, she is strong. The exchange with other families and the atmosphere at the Eating School were strengthening. 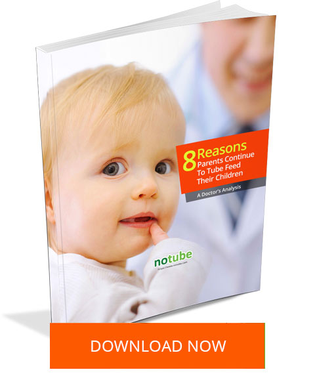 All parents made similar experiences and were at the same point… as well as the availability and the support of the NoTube Team. We were well advised by the NoTube Team! We could raise all our concerns and doubts at all times, they were available and reassured us very much! They helped us to work on ourselves, to change the experiences and habits towards food to support our child ideally in the “learning to eat” process… The children were in daily exchange with the team, the development of each child during the wean could be observed and guided in an optimal way. Really a professional and human team. My daughter goes to school, eats at the cafeteria, at her nanny’s, she sleeps at her grandparent’s house… she is more open to other children, is sociable, but she knows that she is different compared to other children. We must not fear that she removes her PEG accidentally, no daily nursing (her tube site was always sore, we had to treat her with nitrate), she doesn’t retch and gag anymore, she eats almost everything! And as far as I am concerned, I was able to go back to work. We have been on holiday for the very first time and that is really the best! To see how she thrives at school and at daycare!